Spoilers ahead for Diplomatic Implausibility! 200 YEARS AGO: The expanding Klingon Empire found a frozen world rich in deposits of the mineral topaline. They named the planet taD -- Klingon for "frozen" -- and they called the people "jeghpu'wI'" -- conquered. NOW: The Klingons have returned to taD and re-established their control. But the stubborn rebels insist on Federation recognition. A solution to the diplomatic impasse must be found, a task that falls to the Federation's new ambassador to the Klingon Empire -- Worf. 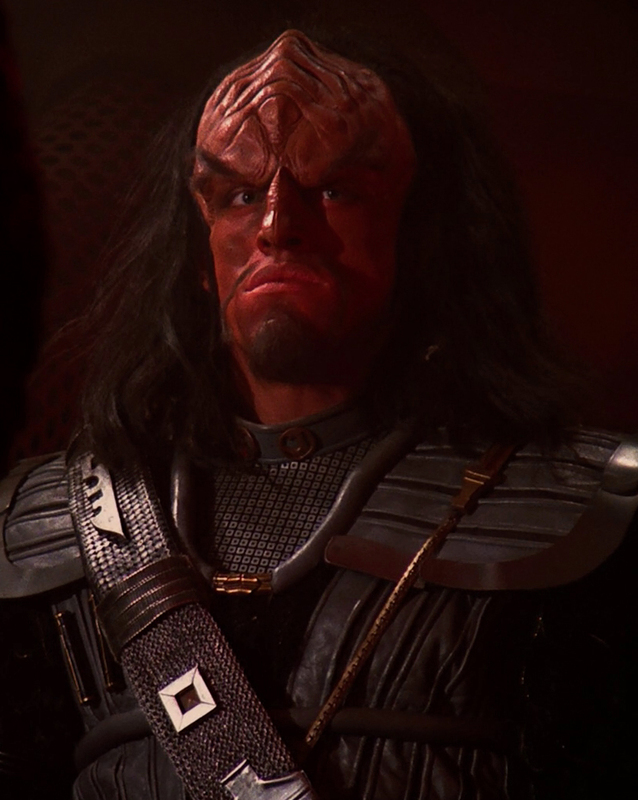 Over the past few decades, the idea of having an all-Klingon Star Trek series has occasionally been bandied about by fans. The idea of Star Trek from not only a non-human perspective, but from a non-Federation perspective, is a compelling one that is understandably enticing. I have never thought that a non-Federation perspective series is a good idea; however, the occasional flirtation with the idea works well. Deep Space Nine episodes such as "Soldiers of the Empire" and "Once More Unto the Breach" feature adventures almost entirely from the perspective of the Klingons, and those two are among my favorite episodes. 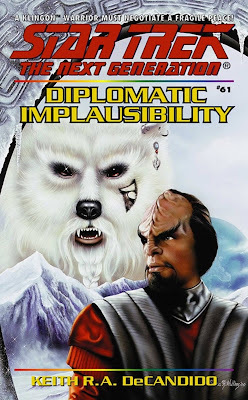 At first glance of the cover, Diplomatic Implausibility appears to be a standard TNG novel, but open to the story and you'll discover it is anything but. While the primary story involves Worf's first assignment as Federation Ambassador to the Klingon Empire, it's the "supporting cast" who are the true stars of the novel. Diplomatic Implausibility introduces a new ship and crew to the TrekLit universe: the Chancellor-class Klingon cruiser I.K.S. Gorkon under the command of Captain Klag. Klag, now a captain, commands the I.K.S. Gorkon, the starship that ferries Worf to his assignment on taD. You may remember Klag from a second-season episode of TNG, "A Matter of Honor." Klag was the second officer of the I.K.S. Pagh under Captain Kargan, and the backstory we get for him in this novel fills in the intervening years. 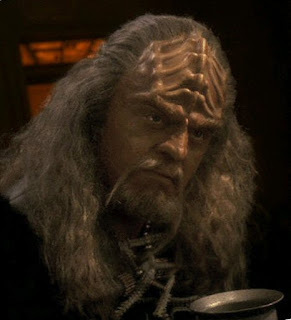 It turns out that Kargan was an honorless Klingon, and a pretty poor captain (which we kind of figured from his actions in "A Matter of Honor"). Stuck serving him for far too long, Klag finally got out from under his shadow when the Pagh was shot down during the Dominion War, leaving Klag as the sole survivor and allowing him to perform an impressive feat in defeating the Pagh's attackers. The rest of the Gorkon crew are mostly made up of Klingons we've seen before: first officer Drex is Chancellor Martok's son from "The Way of the Warrior" (DS9); second officer Toq is the young Klingon Worf rescued from a Romulan prison camp in "Birthright, Part II" (TNG); weapons officer Rodek is actually the mind-wiped Kurn, Worf's brother; helmsman Leskit was a member of the I.K.S. Rotarran's crew in the aforementioned "Soldiers of the Empire"; chief engineer Kurak was seen in the TNG episode "Suspicions." Rounding out the crew are a few newcomers we haven't seen before: medical officer B'Oraq studied medicine in the Federation and thus has some radical new ideas to share with her Klingon brethren; Krevor is a low-born Klingon woman who is assigned to be Worf's aide by Drex, who believes this to be an insult to Worf; Vall is an engineer under Kurak's command, and he is not a typical Klingon: he has nice teeth, short combed hair, and a "whiny voice like a Ferengi." Diplomatic Implausibility does a wonderful job of introducing these new characters, and it is not at all surprising that they end up featuring in a book series of their own. It does strike me as odd that this is a numbered TNG novel, however, as the story has little to do with The Next Generation characters beyond some brief cameos and, of course, Worf. The plot of the novel centers around a planet that the Klingons call taD, which means "frozen." A world with a very cold climate, taD is a source for a valuable mineral, and home to a native population called the al'Hmatti who are rebelling against Klingon control of their planet. They have reached out to the Federation for assistance with their strained relationship with the Klingons. Familiar characters aboard the Gorkon include helmsman Leskit from DS9's "Soldiers of the Empire." For me, the strength of this novel lies with the characters and the various arcs they go through. At the beginning of the novel, Klag resents Worf a great deal, believing his position to be the result of nepotism due to his being a part of the House of Martok. However, over the course of the book, Klag recognizes Worf for the honorable man he is and they come to an understanding. There are some other great character moments in Diplomatic Implausibility, including an unlikely courtship between Leskit and Kurak which was a great deal of fun. Leskit has a terrifically sarcastic personality and his story was a joy to read. Diplomatic Implausibility, more than anything else, is an introduction to the crew of the Gorkon, setting them up for more adventures to come. However, it is also an interesting story featuring Worf's first assignment as a diplomat. I love the character of Worf, and it's fun to see him in a new role with which he is unfamiliar. The characters in this novel are at the heart of what makes it great, and even though the fact we have seen so many of them before contributes to a "small universe" feeling, the characters themselves are interesting enough that I can easily forgive the author that indulgence. An early TNG numbered novel: The Peacekeepers by Gene DeWeese!